खनिज धाःगु जमिनं पिकाइगु कच्चा पदार्थ ख। A mineral is a naturally occurring substance formed through geological processes that has a characteristic chemical composition, a highly ordered atomic structure and specific physical properties. A rock, by comparison, is an aggregate of minerals and need not have a specific chemical composition. Minerals range in composition from pure elements and simple salts to very complex silicates with thousands of known forms. The study of minerals is called mineralogy. a mineral is an element or chemical compound that is normally crystalline and that has been formed as a result of geological processes. The modern classifications include an organic class - in both the new Dana and the Strunz classification schemes. The chemical composition may vary between end members of a mineral system. For example the plagioclase feldspars comprise a continuous series from sodium-rich albite (NaAlSi3O8) to calcium-rich anorthite (CaAl2Si2O8) with four recognized intermediate compositions between. Mineral-like substances that don't strictly meet the definition are sometimes classified as mineraloids. Other natural-occurring substances are nonminerals. Industrial minerals is a market term and refers to commercially valuable mined materials (see also Minerals and Rocks section below). A crystal structure is the orderly geometric spatial arrangement of atoms in the internal structure of a mineral. There are 14 basic crystal lattice arrangements of atoms in three dimensions, and these are referred to as the 14 "Bravais lattices". Each of these lattices can be classified into one of the six crystal systems, and all crystal structures currently recognized fit in one Bravais lattice and one crystal system. This crystal structure is based on regular internal atomic or ionic arrangement that is often expressed in the geometric form that the crystal takes. Even when the mineral grains are too small to see or are irregularly shaped, the underlying crystal structure is always periodic and can be determined by X-ray diffraction. Chemistry and crystal structure together define a mineral. In fact, two or more minerals may have the same chemical composition, but differ in crystal structure (these are known as polymorphs). For example, pyrite and marcasite are both iron sulfide, but their arrangement of atoms differs. 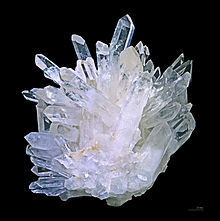 Similarly, some minerals have different chemical compositions, but the same crystal structure: for example, halite (made from sodium and chlorine), galena (made from lead and sulfur) and periclase (made from magnesium and oxygen) all share the same cubic crystal structure. Crystal structure greatly influences a mineral's physical properties. For example, though diamond and graphite have the same composition (both are pure carbon), graphite is very soft, while diamond is the hardest of all known minerals. This happens because the carbon atoms in graphite are arranged into sheets which can slide easily past each other, while the carbon atoms in diamond form a strong, interlocking three-dimensional network. There are currently more than 4,000 known minerals, according to the International Mineralogical Association, which is responsible for the approval of and naming of new mineral species found in nature. Of these, perhaps 100 can be called "common," 50 are "occasional," and the rest are "rare" to "extremely rare." A mineral is a naturally occurring solid with a definite chemical composition and a specific crystalline structure. A rock is an aggregate of one or more minerals. (A rock may also include organic remains and mineraloids.) Some rocks are predominantly composed of just one mineral. For example, limestone is a sedimentary rock composed almost entirely of the mineral calcite. Other rocks contain many minerals, and the specific minerals in a rock can vary widely. Some minerals, like quartz, mica or feldspar are common, while others have been found in only one or two locations worldwide. The vast majority of the rocks of the Earth's crust consist of quartz, feldspar, mica, chlorite, kaolin, calcite, epidote, olivine, augite, hornblende, magnetite, hematite, limonite and a few other minerals. Over half of the mineral species known are so rare that they have only been found in a handful of samples, and many are known from only one or two small grains. Commercially valuable minerals and rocks are referred to as industrial minerals. Rocks from which minerals are mined for economic purposes are referred to as ores (the rocks and minerals that remain, after the desired mineral has been separated from the ore, are referred to as tailings). A main determining factor in the formation of minerals in a rock mass is the chemical composition of the mass, for a certain mineral can be formed only when the necessary elements are present in the rock. Calcite is most common in limestones, as these consist essentially of calcium carbonate; quartz is common in sandstones and in certain igneous rocks which contain a high percentage of silica. Other factors are of equal importance in determining the natural association or paragenesis of rock-forming minerals, principally the mode of origin of the rock and the stages through which it has passed in attaining its present condition. Two rock masses may have very much the same bulk composition and yet consist of entirely different assemblages of minerals. The tendency is always for those compounds to be formed which are stable under the conditions under which the rock mass originated. A granite arises by the consolidation of a molten magma at high temperatures and great pressures and its component minerals are those stable under such conditions. Exposed to moisture, carbonic acid and other subaerial agents at the ordinary temperatures of the Earth's surface, some of these original minerals, such as quartz and white mica are relatively stable and remain unaffected; others weather or decay and are replaced by new combinations. The feldspar passes into kaolinite, muscovite and quartz, and any mafic minerals such as pyroxenes, amphiboles or biotite have been present they are often altered to chlorite, epidote, rutile and other substances. These changes are accompanied by disintegration, and the rock falls into a loose, incoherent, earthy mass which may be regarded as a sand or soil. The materials thus formed may be washed away and deposited as sandstone or siltstone. The structure of the original rock is now replaced by a new one; the mineralogical constitution is profoundly altered; but the bulk chemical composition may not be very different. The sedimentary rock may again undergo metamorphism. If penetrated by igneous rocks it may be recrystallized or, if subjected to enormous pressures with heat and movement during mountain building, it may be converted into a gneiss not very different in mineralogical composition though radically different in structure to the granite which was its original state. Classifying minerals can range from simple to very difficult. A mineral can be identified by several physical properties, some of them being sufficient for full identification without equivocation. In other cases, minerals can only be classified by more complex chemical or X-ray diffraction analysis; these methods, however, can be costly and time-consuming. Crystal structure and habit: See the above discussion of crystal structure. A mineral may show good crystal habit or form, or it may be massive, granular or compact with only microscopically visible crystals. Hardness: the physical hardness of a mineral is usually measured according to the Mohs scale. This scale is relative and goes from 1 to 10. Minerals with a given Mohs hardness can scratch the surface of any mineral that has a lower hardness than itself. Luster indicates the way a mineral's surface interacts with light and can range from dull to glassy (vitreous). रङ्ग indicates the appearance of the mineral in reflected light or transmitted light for translucent minerals (i.e. what it looks like to the naked eye). Iridescence - the play of colors due to surface or internal interference. Labradorite exhibits internal iridescence whereas hematite and sphalerite often show the surface effect. Streak refers to the color of the powder a mineral leaves after rubbing it on an unglazed porcelain streak plate. Note that this is not always the same color as the original mineral. Cleavage describes the way a mineral may split apart along various planes. In thin sections, cleavage is visible as thin parallel lines across a mineral. Fracture describes how a mineral breaks when broken contrary to its natural cleavage planes. Chonchoidal fracture is a smooth curved fracture with concentric ridges of the type shown by glass. Hackley is jagged fracture with sharp edges. Specific gravity relates the mineral mass to the mass of an equal volume of water, namely the density of the material. While most minerals, including all the common rock-forming minerals, have a specific gravity of 2.5 - 3.5, a few are noticeably more or less dense, e.g. several sulfide minerals have high specific gravity compared to the common rock-forming minerals. Other properties: fluorescence (response to ultraviolet light), magnetism, radioactivity, tenacity (response to mechanical induced changes of shape or form), piezoelectricity and reactivity to dilute acids. Minerals may be classified according to chemical composition. They are here categorized by anion group. The list below is in approximate order of their abundance in the Earth's crust. The list follows the Dana classification system. 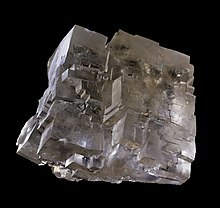 The largest group of minerals by far are the silicates (most rocks are ≥95% silicates), which are composed largely of silicon and oxygen, with the addition of ions such as aluminium, magnesium, iron, and calcium. Some important rock-forming silicates include the feldspars, quartz, olivines, pyroxenes, amphiboles, garnets, and micas. The carbonate minerals consist of those minerals containing the anion (CO3)2- and include calcite and aragonite (both calcium carbonate), dolomite (magnesium/calcium carbonate) and siderite (iron carbonate). Carbonates are commonly deposited in marine settings when the shells of dead planktonic life settle and accumulate on the sea floor. Carbonates are also found in evaporitic settings (e.g. the Great Salt Lake, Utah) and also in karst regions, where the dissolution and reprecipitation of carbonates leads to the formation of caves, stalactites and stalagmites. The carbonate class also includes the nitrate and borate minerals. Sulfates all contain the sulfate anion, SO42-. Sulfates commonly form in evaporitic settings where highly saline waters slowly evaporate, allowing the formation of both sulfates and halides at the water-sediment interface. Sulfates also occur in hydrothermal vein systems as gangue minerals along with sulfide ore minerals. Another occurrence is as secondary oxidation products of original sulfide minerals. Common sulfates include anhydrite (calcium sulfate), celestine (strontium sulfate), barite (barium sulfate), and gypsum (hydrated calcium sulfate). The sulfate class also includes the chromate, molybdate, selenate, sulfite, tellurate, and tungstate minerals. The halides are the group of minerals forming the natural salts and include fluorite (calcium fluoride), halite (sodium chloride), sylvite (potassium chloride), and sal ammoniac (ammonium chloride). Halides, like sulfates, are commonly found in evaporitic settings such as playa lakes and landlocked seas such as the Dead Sea and Great Salt Lake. The halide class includes the fluoride, chloride, bromide and iodide minerals. Oxides are extremely important in mining as they form many of the ores from which valuable metals can be extracted. They also carry the best record of changes in the Earth's magnetic field. They commonly occur as precipitates close to the Earth's surface, oxidation products of other minerals in the near surface weathering zone, and as accessory minerals in igneous rocks of the crust and mantle. Common oxides include hematite (iron oxide), magnetite (iron oxide), chromite (iron chromium oxide), spinel (magnesium aluminium oxide - a common component of the mantle), ilmenite (iron titanium oxide), rutile (titanium dioxide), and ice (hydrogen oxide). The oxide class includes the oxide and the hydroxide minerals. Many sulfide minerals are economically important as metal ores. Common sulfides include pyrite (iron sulfide - commonly known as fools' gold), chalcopyrite (copper iron sulfide), pentlandite (nickel iron sulfide), and galena (lead sulfide). The sulfide class also includes the selenides, the tellurides, the arsenides, the antimonides, the bismuthinides, and the sulfosalts (sulfur and a second anion such as arsenic). The phosphate mineral group actually includes any mineral with a tetrahedral unit AO4 where A can be phosphorus, antimony, arsenic or vanadium. By far the most common phosphate is apatite which is an important biological mineral found in teeth and bones of many animals. The phosphate class includes the phosphate, arsenate, vanadate, and antimonate minerals. The elemental group includes metals and intermetallic elements (gold, silver, copper), semi-metals and non-metals (antimony, bismuth, graphite, sulfur). This group also includes natural alloys, such as electrum (a natural alloy of gold and silver), phosphides, silicides, nitrides and carbides (which are usually only found naturally in a few rare meteorites). The organic mineral class includes biogenic substances in which geological processes have been a part of the genesis or origin of the existing compound. Minerals of the organic class include various oxalates, mellitates, citrates, cyanates, acetates, formates, hydrocarbons and other miscellaneous species. Examples include whewellite, moolooite, mellite, fichtelite, carpathite, evenkite and abelsonite. This page was last edited on १ अप्रिल २०१५, at ०५:५३.